The screens on TV we watched as a child almost never broke. Why? They were thick, heavy, and things were almost never thrown at them. The new LCD screens are thin, light, and very easy to damage…especially if you love playing with your Wii. 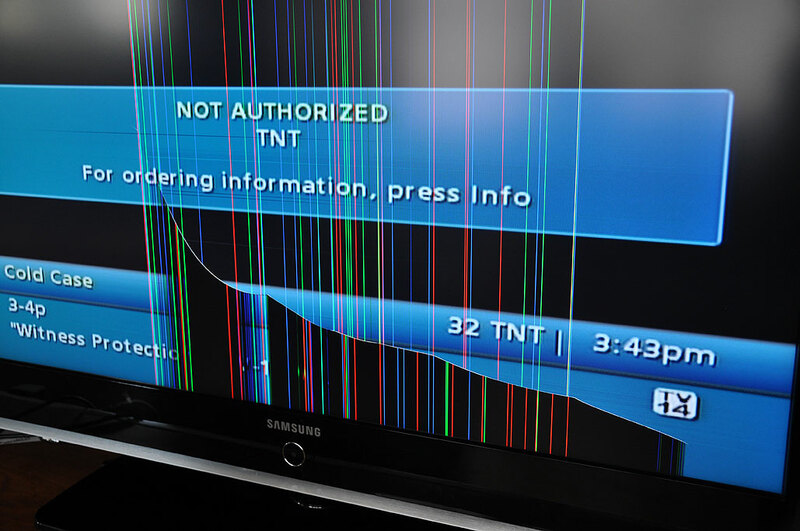 Our editor Carolyn has termed the break-your-tv-by-mistake condition “Wii woes.” LCD screens are being damaged in sufficient numbers that an emerging business is, uh, emerging, in LCD television repair fueled by parts from all the broken sets available on Craigslist. We thought fixing one would make for an interesting DIY repair article. So we found a broken 47″ Samsung on Craigslist a few days ago and bought it for less than $100. The unit clearly had something wrong with the LCD screen. Apparently, LCD screen are very expensive to replace and it is not really cost-effective to replace a broken one, the main reason being that most of the TV manufacturers use screens manufactured to their specification. So it is next to impossible to take one maker’s LCD screen and use it with another maker’s electronics unless one REALLY knows what one is doing. 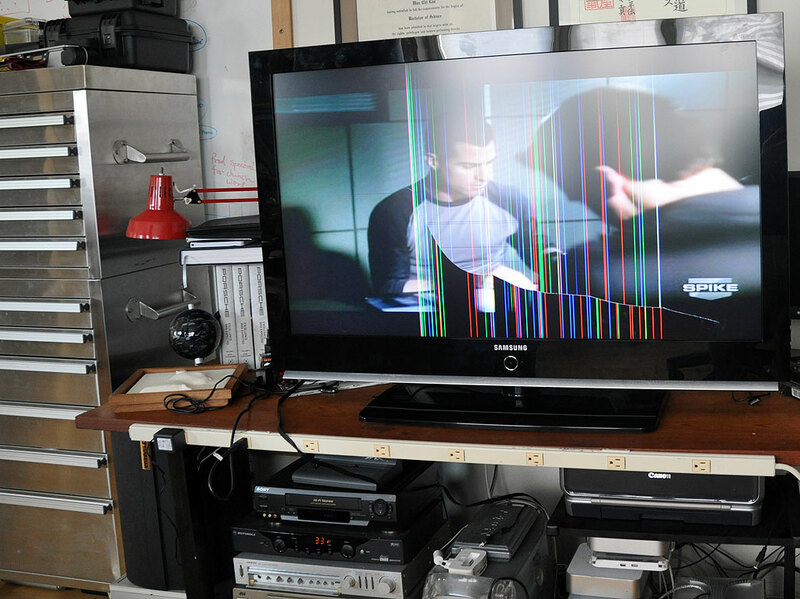 For folks with a non-functional LCD TV, especially if it is a cracked screen, often the only realistic option is to junk the set and buy a new one. Now that LCDs have been around for a few years, other problems have started to surface, problems often not related to the LCD screen at all. Some of the problems are due to poor or unreliable circuit designs. Others can be traced back to cheap capacitors used by the makers in an effort to reduce cost. This is especially true for ones used in the power supplies. When the capacitors die, the TV will typically not power on reliably or at all. The fix is often to find and replace a $1 part with a more reliable $3 part. The problem is locating the defective $1 part. For DIY-ers, the simpler approach is to localize the problem to a general area (tuner, power supply, sound, etc…) and start swapping modules. This is where LCD TV parts scavengers can make a few bucks or even create an online parts business. A broken $1000 LCD TV can contain up to $2000 in resellable logic boards, power supply, and other miscellaneous components. The interesting thing is that even though the LCD panel is theoretically worth more, a set with working electronics (like ours) will actually fetch a higher resale price because the boards are easier to ship than a large LCD panel. The situation is exactly like parting out a car. A $20,000 car can contain $60,000 worth of parts if sold individually. That is assuming one can resell EVERYTHING, which of course, is never the case. When we posted on Craigslist asking if anyone had the same broken model but with a good LCD screen to donate to the project, we got a ton of email (80% SPAM) offering to buy the busted unit. After sorting out the crap, a few serious offers did emerge. We negotiated with the willing buyers and sold the set a few days later for 3X what we paid for it. This was not because we didn’t want to do the DIY project, but because it was just too good of a return on investment that we couldn’t let it pass:-) We’ll keep our eyes out for another potential “fixer-upper.” This time, we’ll look for one with a good screen but bad electronics. So, if you have an LCD TV that is not working, you don’t have to throw it into the trash. If you have the patience and are willing to put some work into finding the right parts, you might be able to get it working again for a lot less than you might think. List your LCD TV’s exact make and model number on Craigslist, sit back, and wait. You may find that someone may have that exact model and is ready to drop it off at the dump. If you do decide to sell the bum TV, a realistic expectation is about $0.10 to the dollar of a set’s current street price (ie: $500 used = $50 not working). Hey… it was money you were going to toss into the trash anyway.